The Animal Protection Society (APS) is a Samoan organisation centred on providing veterinary care for domestic animals. With dedication, they strive for a reduced and healthy domestic animal population. Due to a lack of Samoan vets and poor local knowledge of animal welfare, APS rely on volunteers who are certified veterinarians to help them achieve their goals and deliver numerous services to the Samoan community. Therefore, as a qualified veterinarian or veterinary nurse, you will be able to help and support APS’s staff and volunteers in many significant areas. 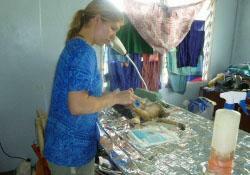 How can volunteer veterinarians or veterinary nurses help in Samoa? With your experience and skills, you will cover a number of important roles from providing consultations or treatments for sick and injured domestic animals to assisting or performing animal sterilisation. You will also help manage the daily running of APS. You may also help APS with the development of their Mobile Veterinary Clinic, the provision of free mass de-sexing services as well as providing educational programmes to schools and community groups. As an experienced veterinarian, you will be able to work unsupervised on certain cases, allowing local staff time to carry out other pressing tasks. You will work weekdays – and sometimes out of hours – depending on the individual project and how you develop your role with your project supervisor. This project runs throughout the year. You will be working for an established organisation, with existing and devoted local sponsors and donors, which have a well-developed community outreach programme. Consequently you will be able to grow your existing expertise by working in an environment where the government, sadly, has limited resources. Developing a human resourse strategy for provision of fully staffed APS operations. Using your qualifications to train staff and other volunteers. Forming baseline population data studies for the Samoan community. Developing projects/programmes through the process of sharing ideas. Ideally, a qualified veterinarian or veterinary nurse would also possess at least two years’ experience of practising professionally.